With China’s rapid ascendance to great power status, the U.S.-China relationship has become one of the most important international relationships in the world today. This book explores relations between the U.S. and China, focusing in particular on China policymaking in the U.S. Congress, which has been unusually active in the development of this relationship. 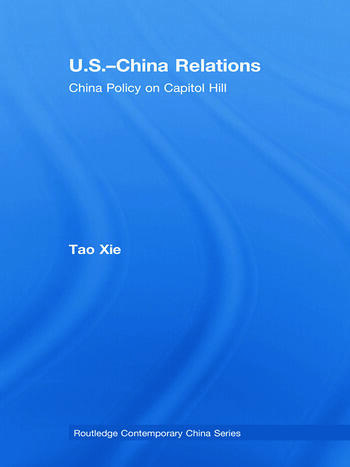 Based on detailed analysis of China bills introduced in Congress over the past three decades, it provides detailed analysis of how Congressional policymaking works in practice, and explores the most controversial issues in U.S.-China relations: Taiwan, trade and human rights. It considers the voting patterns and party divisions on these issues, showing that liberals and conservatives often form an alliance concerning China because China’s authoritarian regime, human rights problems, soaring trade surplus with the U.S and rising military power attract criticism from both camps. It also argues that congressional committees, bicameralism and presidential veto make it virtually impossible for Congress to legislate on China, despite its intense preferences, and therefore Congress often turns to informal – but no less effective – means to exert influence on China policy, such as framing public opinion and generating situations that result in anticipated reactions by the executive branch or Beijing. Tao Xie is Assistant Professor at the American Studies Centre, Beijing Foreign Studies University, China. He holds a Ph.D. in political science. His primary research interests are U.S. Congress and American electoral behaviour.